You'll already have a pretty good idea whether or not a museum of industrial heritage is for you. 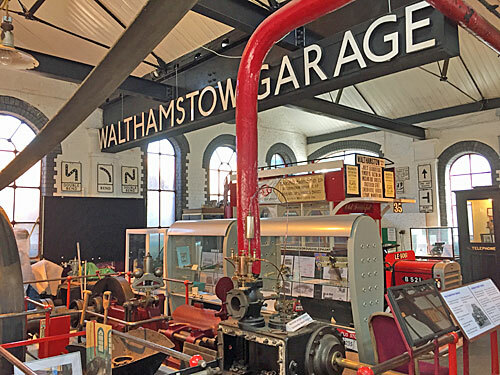 Specifically a museum dedicated to the industrial heritage of the Lea Valley. A proper assemblage of old technology. A job lot of outmoded transport. There, you're either salivating or switching off. The location is a converted sewage pumping works, not far from St James Street station. It's not somewhere you'd ever stumble across by mistake. Part of the street-corner site was redeveloped as social housing recently, but the remainder holds firm with sheds, artefacts and vehicles. 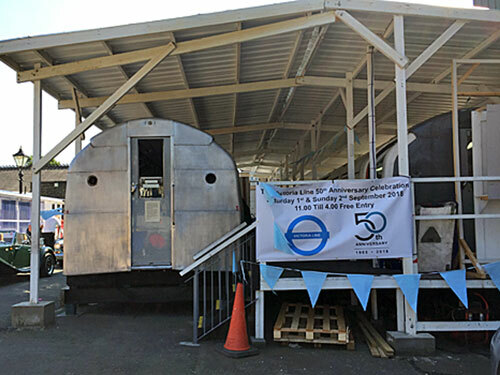 Two of the vehicles are Victoria line carriages, hence a buzz of interest over the weekend. One's fully restored, and it was hoped the other would be in time for the 50th anniversary, but it's only 50% there. Visitors can walk round (and sit in) both. I shared my time inside car 3049 with the Mayor of Waltham Forest. 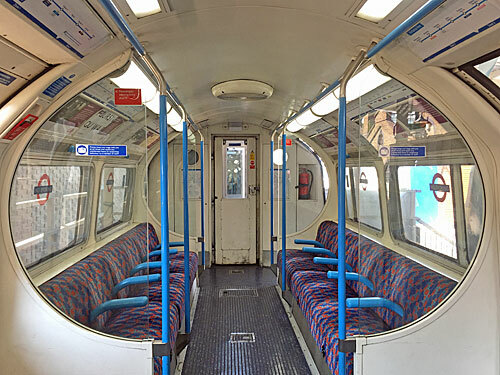 I don't know what you like to do in old tube carriages. I like to scrutinise the evolution of the old line diagrams. Others choose to sit in the cab and pretend to drive the train. Some fork out to attend a supper club with gourmet food served up at temporary tables. The museum would be chuffed if your interest stretched to restoration. Across the yard in the original building, several of the exhibits are stationary engines. This is a pumphouse after all. On the last Sunday of the month volunteers steam them up so you can watch. One section's about Baby Bellings. Also present is an old omnibus, although it's not real, it's two-thirds size and was built for the London stage. But it's especially about trains. Models and signs and posters and more models and other rail-related objects, including at least three model railways. A group of supervised youngsters was very keen for me to see them operating the model railway. I liked the old map which showed what Westfield looked like when it was all sidings. Obviously there's a Victoria line display - a circular case including souvenirs from the opening days. 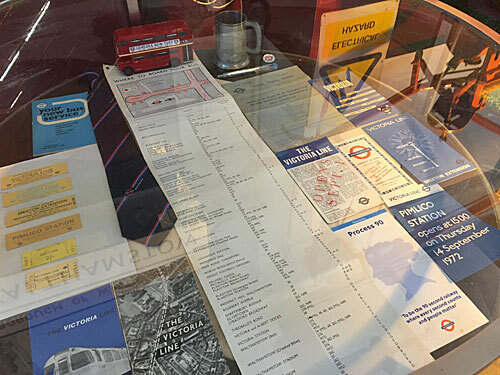 Various tickets, a tie, instructions for the operation of the royal train, stamped maps, extension leaflets, bus changes and the like. An extra temporary exhibition is posted up outside the cafe, complete with gorgeous vintage posters. The other big thing here is fire engines. A trio of garages is packed out with vehicles, helmets, hoses and tales of gallantry. "We've seen this on our school trip," said one young girl as grandpa led her inside. She repeated the same line at least five times, and in a nice way, not like she was regretting being here second time around. One of the older visitors was overkeen to stress his transport credentials, engaging with a volunteer in nostalgic oneupmanship. "Of course it affected route 35A," he said. "I've got a lot of stuff like this at home." "I see you have the old sign for Walthamstow Garage, but I bet you don't have London Forest Travel". They did. The Pumphouse crew were delighted by the number of people who came round over the weekend. Annie's van sold plenty of toasties and chips. 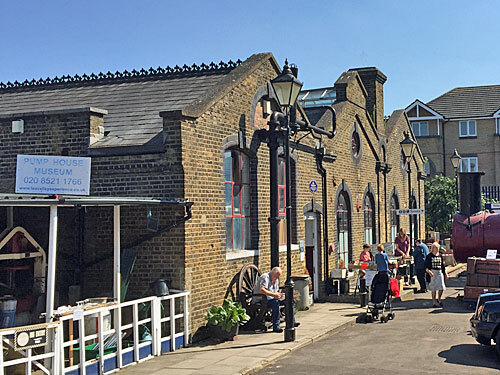 The industrial heritage of the Lea Valley got the attention it doesn't always receive, and risks not getting in the future. Visit, or even volunteer, and keep it ticking over.